Candy may be the official treat of Halloween, but the food festivities don’t have to stop at peanuts and caramel. 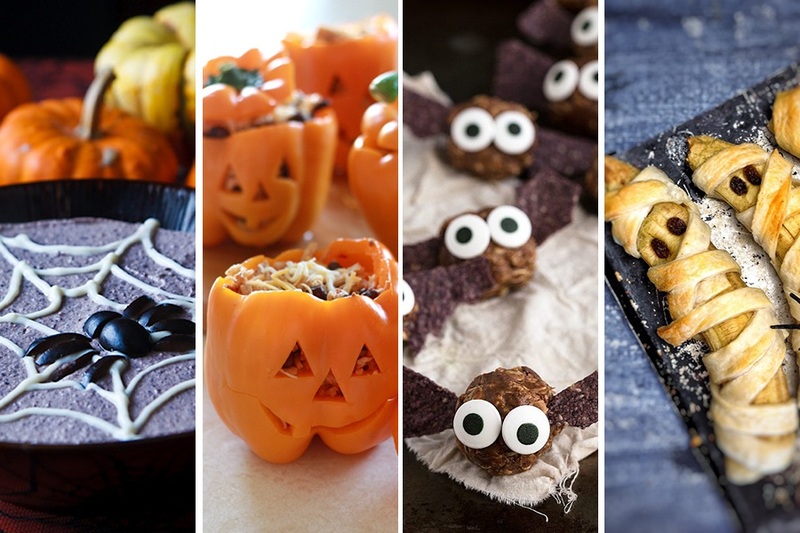 If you’re looking for a spooky treat to bring to your Halloween party this year, look no further than this list of healthy Halloween recipes. These recipes range from sweet to savory and feature vegan and keto-friendly options. Plus, they won’t leave you with the dreaded sugar high. Instead of carving pumpkins this year, carve peppers! Orange peppers make for an edible, pumpkin bowl, while chicken, rice, and beans provide a complete protein. This quick and easy recipe is a great afternoon snack option for kids. Simply wrap vegan pastry strips around a banana, bake, and add raisins for eyes. If desired, serve with vegan ice cream or yogurt. Spinach pasta gets a creepy twist with the addition of string cheese and olives. Serve the pasta with sauce ladled over the top, then slice the string cheese into discs and add the olives on top to look like eyeballs. To satisfy your sweet tooth, this smoothie features produce such as pineapple, carrot, and apple. Camu camu powder also provides vitamin C, potassium, and antioxidants. Blue tortilla chips are used to add wings to these healthy energy bites, made with peanut butter, cocoa powder, oats, and more. The bites will last for five to seven days in the refrigerator. For a spooky and savory appetizer, try this black bean hummus. To draw the spider web on top, use a pastry bag filled with soy yogurt or tahini and pipe the design. Serve the hummus with pita chips or multigrain tortilla chips. The classic “cup of dirt” recipe from your childhood gets an upgrade with these mousse pots. To make the mousse pots extra convincing, place edible flowers on top of each one. This simple recipe makes for a healthy side dish or dessert. If you prefer a savory sweet potato as opposed to a sweet one, use a pinch of taco seasoning on top. These fries also make a great alternative to chips when serving guacamole. Tofu serves as a substitute for egg salad in this recipe, but if you’re not a vegan feel free to use eggs. Use a melon baller to carve space out of the potatoes for the filling. This Keto-friendly pizza features cheese in the shape of ghosts thanks to a cookie cutter. Serve the pizza with a sprinkle of parmesan cheese and garnish with basil.